Below is the full statement released by the President-elect thanking the IEC and Gambians for conducting the most successful election in Gambia’s history. The release also highlights the the need for people to refrain from post election violence. Fellow citizens and friends of The Gambia I wish to take this opportunity to congratulate the Independent Electoral Commission of The Gambia in particular and the Electorate at large for delivering free, fair and credible elections. In the same vein, I wish to congratulate the contestants for accepting the results of the elections as the undiluted verdict of the Electorate. The people of the Gambia have spoken. They have shown that they have the power to determine their destiny. For the first time in Gambian history change has come in a peaceful manner through the ballot box based on the consent of the people. We have all made history. There are no winners or losers in this election. We brought about change to build an inclusive society. 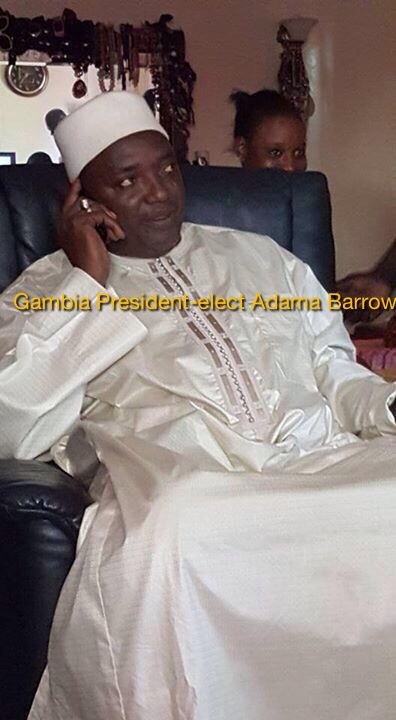 Now Gambians and Gambia can raise our heads and count ourselves among the most democratic nations in the world. The congratulatory message from President Jammeh, the outgoing president, and his promise to work with me as the incoming president, to ensure a smooth transfer of power is another milestone in the history of democratic transfer of power in Africa. We have agreed to set up parallel teams, on both sides, to work hand in hand to formulate and implement the modalities of the transition. My team as an incoming President has been constituted. It comprises Gambians of integrity and competence who are now charged with the responsibility of formulating a road map for the transition. They have presented the transitional agenda of the incoming administration which has been approved by me and the Coalition stakeholders as a realistic, practical and time bound programme of activities to ensure peaceful transfer of power. I am sure many here and abroad are wondering why I have not assumed office on Friday 2nd December 2016. The answer is simple. I was declared a winner of the Presidential Election based on the letter and spirit of 1997 Constitution and the Electoral laws of the Gambia. The incumbent respected the results and promised to work with me to have a smooth transfer of power based on the Constitution of the Republic. That is the law. After broad consultations with Coalition stakeholders and legal experts it is now conclusive that I should assume office on the day the term of office of President Jammeh expires. Hence my inauguration as the President of the Republic should take Place in the third week of January 2017. The transition team is now working on the modalities of the swearing in ceremony and would communicate all developments on the transition to the public, as and when it is necessary for the sake of accountability and transparency. I know that some have felt that I should be making statements to keep the public informed. I wish to allay your fears and assure you that progress is being made to facilitate a smooth transfer of power. People should understand that to do what has never been done before requires careful planning and measuring of steps before taking them. This is precisely the way this administration intends to do business. We will consult and build consensus before issuing statements. It is important to assert that this administration intends to give Gambia a new start. It will respect the rule of law, especially the supremacy of the constitution before, during and after assuming state power. Democracy will be enlarged and consolidated; respect for human rights shall be the cornerstone of the system of justice of the country. Good governance shall be enhanced by Constitutional, legal and institutional reforms that would safeguard the delivery of services to address the needs and aspirations of the people. I wish to register my commitment to my election pledges that I will not preside over a country where arrests would take place without due process; detention affected without trial and non- violent dissent met with imprisonment. Neither speech nor non-violent civil disobedience would lead to the imprisonment of any Gambian citizen under the administration of the Coalition. All laws that criminalize speech or non-violent civil dissent will be repealed. In that regard I have requested the out- going President to exercise his powers and that of the Attorney General to ensure the release of such categories of prisoners or detainees as I have mentioned as a good will gesture. I would not want to assume political office and start a clean- up exercise to remedy existing human rights violations which could be remedied by the out-going President. I have also asked the team to arrange audience with the Security Chiefs, the IEC Chairman, the Speaker of the National Assembly and the National Assembly Authority, the Chief Justice and the Judicial Service Commission to enhance cooperation and ensure the smooth transfer of power. The Security Chiefs have asked me to add my voice in promoting violence –free post- election commemoration activities. All of us want a post-election environment that is harassment and violence-free. The Gambia is one nation and one people. We are used to respecting diversity. We must maintain the spirit of Political Pluralism. Each has a right to support the party of one’s choice without being subjected to any harassment or intimidation for exercising one’s rights. All Gambians are free to put on their party colours and should not be harassed for their political choice. Leaders come and go based on choice but the citizenship of the sovereign Gambian remains inviolable. Let us unite as diverse people with a common national interest to ensure that all enjoy peace, liberty and prosperity to give recognition to our common humanity. I want all Gambians to recognize that we are now a part of progressive humanity and none should discriminate the other. I cannot conclude without informing you that in less than a week after the declaration of results, I have received congratulatory messages from countries, international organizations and many donors indicating interest in giving support to the Gambia ,like never before, opening up new avenues for progress and prosperity for the country and her people. I therefore urge all of you to continue to develop a democratic culture where justice, rule of law, good governance and respect for human rights would prevail forever. In this way, the people of the Gambia will forever enjoy peace, freedom and prosperity. As President –Elect I wish to assure you that I will assume office to serve all Gambians irrespective of their ethnic, religious, gender and other divergences. I will not exceed the bounds established by the Constitution and other laws of the country in exercising Executive Authority. I would respect the Independence of the Judiciary and the oversight functions of the National Assembly. Justice and competence in the service of the nation shall be the clarion call of my Administration which all Public Servants will be obliges to pay heed to. I call on all of you to assist this administration to make Gambia a country that belongs to all her citizens; a country that would guarantee freedom and prosperity to all. We pledge our firm allegiance to The Gambia and the people. Long live the Gambia! Long Live the People! Forward Ever! Backward Never!